Want to know what cholesterol is? Find out how high cholesterol can affect your heart and what you can do to manage it. Cholesterol (Matū Ngako) is a type of fat that circulates in your blood. Your body needs some cholesterol to work properly, but when you have high cholesterol (hyperlipidaemia) it speeds up the process of atherosclerosis. This is when plaque builds up in your artery walls, narrowing arteries and restricting blood flow. Eventually the plaque can get so large and hard that it cracks, and a clot forms over the plaque. If this clot blocks an artery it can cause a heart attack or stroke. When do I need to do something about my cholesterol? To find out if you need to do something about your cholesterol levels, visit your doctor or nurse and have a heart and diabetes check. In your heart and diabetes check, your doctor, nurse or health professional will discuss your ideal cholesterol levels, taking into account your overall risk of having a heart attack or stroke. There are no symptoms for high cholesterol so many people are unaware they have it. The only way to find out is to have a blood test. We don't always know what causes high cholesterol. For some people, their liver makes too much cholesterol. This condition often runs in families, which means that a close blood relative (such as a parent) may have it as well. For those people, no matter how much they modify their diet, they may still have high cholesterol. Other factors that contribute to high cholesterol and heart disease are what you have been eating and drinking, how much you are moving each day, and being overweight. There is only one type of cholesterol, but it is carried around the body by different ‘carriers’ (lipoproteins) that have different tasks. There are two types of carriers: LDL (low density lipoprotein) and HDL (high density lipoprotein). 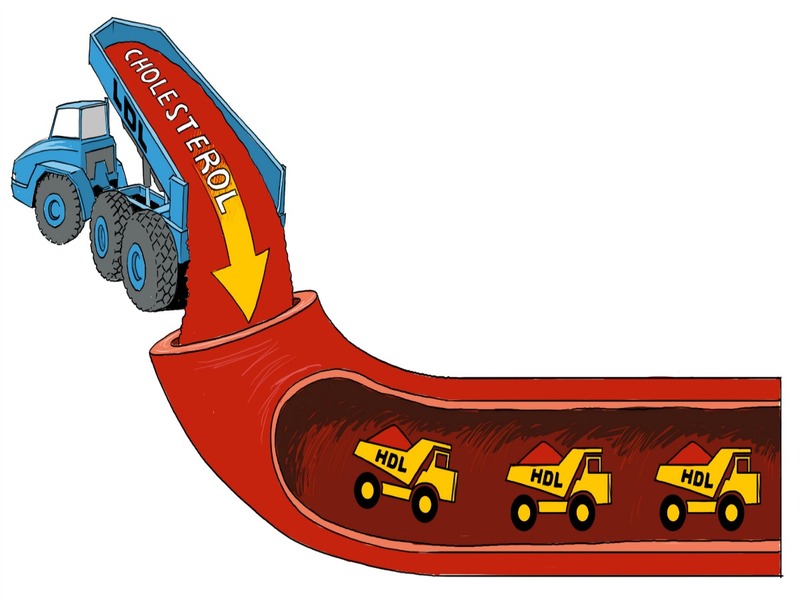 LDL is like a large 'dump truck', and dumps cholesterol in the artery walls. Triglycerides are the most common form of fat in your body. The role of triglycerides is to store and transport fat in the blood. Extra energy from food and alcohol that your body does not need is changed to triglycerides. High triglycerides increase your risk of heart attack and stroke. Total cholesterol is a rough measure of all the cholesterol and triglycerides in your blood. Total cholesterol/HDL cholesterol ratio is the ratio of your total cholesterol to your HDL cholesterol. This ratio is used to measure your risk of heart attack and stroke. What can I do to lower my cholesterol? Making healthy changes to your lifestyle will help you manage your blood pressure, cholesterol and lower your risk of heart attack or stroke. Your doctor may suggest medications as an option that can lower your cholesterol and risk of heart attack and stroke. The thought of making changes may seem overwhelming, but the good news is that even a small change can have a positive impact. You can choose to work on as many or as few risk factors as you would like. The more you change, the better the result. What could have caused my cholesterol to be too high? What are the risks of having high cholesterol? What do my cholesterol results mean? Are medications right for me? How often should I have my cholesterol levels tested? Are there any foods that I should avoid? What exercise is suitable for me, to help lower my cholesterol? How can we make a decision together that is right for me and takes into account my thoughts, beliefs and ideas? You may like to read through and take a copy of our cholesterol PDF to discuss with your doctor. Visit our Journeys pages and read real stories from people living with high cholesterol.